Oddly enough, this year on the holiday that revolves around food, I did very little cooking or creating. My dad’s 60th birthday happened to fall on the holiday and my mom had the entire vegan menu planned out. She allowed me to contribute my Green Bean Casserole and said that if I helped prep the meal (which I would have done regardless) that she would let me share her recipes. See, even though my parents are retired my mom dreams of opening a vegan bakery and keeps trying to talk me into being a business partner so she has a ton of recipes stashed for the grand opening! Due to the fact that she had an abundance of hazelnuts from a local farm and that our little vegan doesn’t care for pumpkin she opted on a less traditional cake. As most of us get when we are experimenting with a new recipe, she was nervous all day about it not being a success. She didn’t need to be concerned. It came out amazing! *Initially my mom wanted the cake to have a swirl effect. Despite her best efforts it came out more as a layer of chocolate on top, which we all enjoyed. *She made this one with a 10″ springform pan which made for a thinner cake. If you prefer a thicker cake you will want to use a 9″ pan. *The hazelnuts we used were raw. To roast, we put them in a 400 degree oven for ten minutes. Grease the bottom of a 9″ or 10″ (see the notes above) springform pan. Mix the cracker crumbs, hazelnuts, and sugar together. Mix in butter. Cover bottom of pan with the crust mixture. Mix sugar, flour, and salt together. Put all ingredients from cream cheese to lemon rind and flour mixture into a food processor until well blended. In order to prevent the cake from cracking do not over mix. 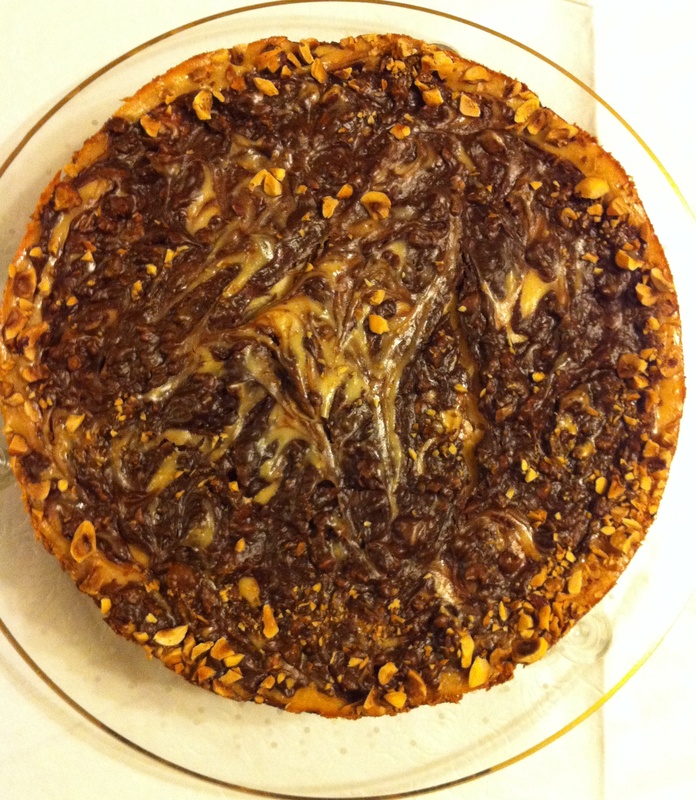 Mix melted chocolate with 1/2 cup hazelnuts separate from cheesecake mix. Pour cream cheese mixture (reserve 1/2 cup) over crumbs in pan. Add reserved cream cheese mixture to chocolate mix. Cover top of cheesecake with chocolate mixture. With a skewer stick it in the cake and move it around to create swirl effect. Be careful to not scrape the bottom. Sprinkle top edges with the 2 tbsp hazelnuts. Bake for 75 minutes. Refrigerate for a minimum of 6 hours before serving. It was even better the second day. 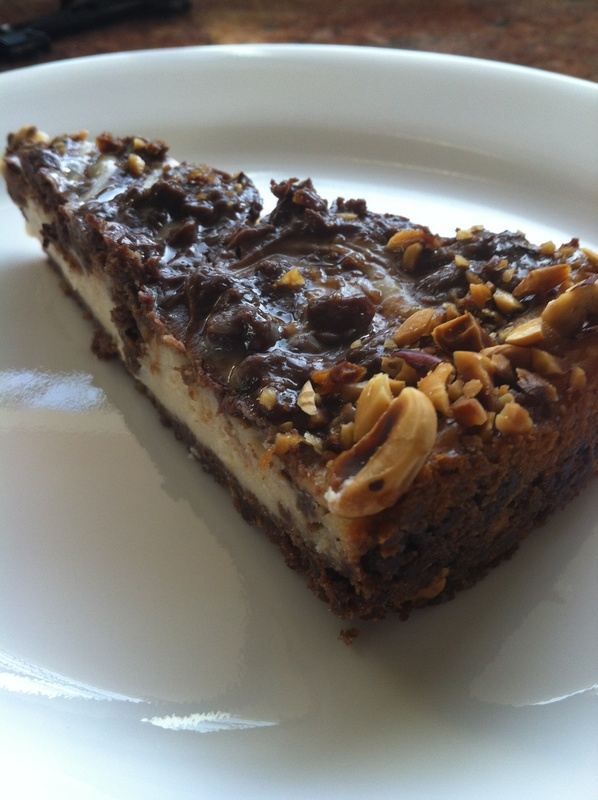 Gallery | This entry was posted in dessert, Mom's Recipes and tagged cheesecake, dessert, vegan. Bookmark the permalink.